Sixteen students at Bath College made it hard for industry experts to choose the winner of this year’s Lovell Stone Group competition, with a sculpture of Pulteney Bridge taking home the prize. The group of full-time and part-time Love2learn stonemasonry students took part in the competition and spent a week creating carvings. They were given some Hartham Park Bath stone and asked to create a piece of sculpture that best represented the city of Bath. Company directors at Lovell Stone Group chose four designs to put on display at the Natural Stone Show at the ExCeL arena in London, the only UK exhibition and conference dedicated to the natural stone industry. Students Sam Bradley, Jeni Wood, David Lambard and Josie Baher all had their work displayed for the chance to win a cash prize. Three-hundred people at the Natural Stone Show voted to choose the winner, with the prize going to Love2learn stone carving student David Lambard. He said: “It was nice for the college to give us those three days to produce the piece and also to be put under time pressure, so that you had to produce something in that time. 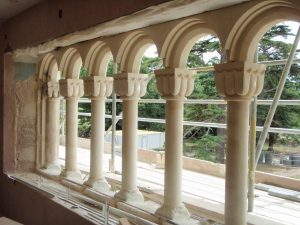 “Before I joined the stone carving class I had no previous experience, but I’m a builder by trade so I am very practical. The class is very sociable and it’s about doing something creative that’s only for me. I’m not producing something for a client, it’s my creation. Having the pieces displayed at The Natural Stone Show was fantastic. Jeni, who also had her work displayed, is a sculptor living in Combe Down. Her design, called Respect, was inspired by the area’s mining history. She said: “It’s a lovely village within the city to live in and there’s a lot of respect for the miners because they were the making of the village. Simon Hart, Managing Director, for the Lovell Stone Group, said: “We were really impressed with the response we got for the competition. “The plan was to shortlist three people, but the quality of the stone carvings presented a real difficulty so we decided to take four peoples’ work to The Natural Stone Show. “It was pretty nerve-wracking transporting them after the hard work students had put in, we wrapped them up extra carefully, so I’m really pleased they’ve made it back to Bath College safe and sound. “Three hundred people voted at the show, we had a really good response and a really close result. If it had been a general election, it would have been a hung parliament! Stonemasonry lecturer Paul Maggs and Love2learn tutor Sam Flintham supported the students during the competition. Paul, who teaches full-time students at the college, said: “We were delighted to be offered the opportunity for students to participate in the stone carving competition sponsored by the Lovell Stone Group. I blog quite often and I genuinely thank you for your content. Your article has really peaked my interest. I will take a note of your blog and keep checking for new information about once a week. I opted in for your Feed as well. Simply want to say your article is as astonishing. The clearness in your post is simply great and i could assume you’re an expert on this subject. Well with your permission let me to grab your feed to keep updated with forthcoming post. Thanks a million and please keep up the rewarding work. My spouse and I stumbled over here from a different page and thought I might as well check things out. I like what I see so now i am following you. Look forward to finding out about your web page yet again. I am actually happy to glance at this weblog posts which carries lots of helpful information, thanks for providing these kinds of information.